My schedule is a bit off this week. I spent a few days out of town for a funeral, and such bittersweet days have a way of blending together. As you might expect, I didn’t do much making this week. Between the travel and the services, there wasn’t much time. I brought my spinning with me for a casual family get-together my last evening there, then remembered the dogs who live at that house. They lose their minds over a single falling leaf; I didn’t think anyone wanted to experience them watching a drop spindle! Before I left, I had been knitting blocks onto one of my scrap blankets. My goal was to use up the leftovers from the Ripple Top, as well as some other scrap yarns. I started the blanket in 2012, and it now measures about 84 inches wide by 21 inches long. Looking at the photo, I can see that I need to catch up on weaving in ends! You might notice two blocks in the bottom row that seem to be upside-down. 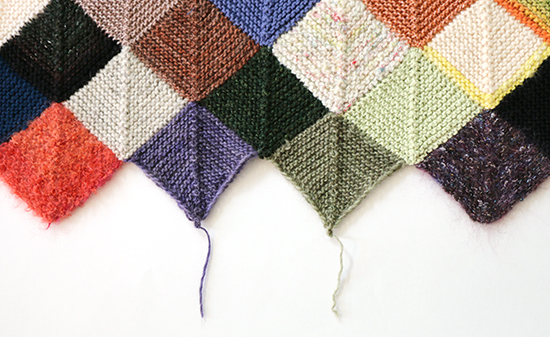 When I first started the blanket, I focused on yarn weights. Once I realized that most of my yarn scraps are wool blends, I decided that I wanted the entire blanket to be wool blends. Two of my initial blocks were made from other types of fiber; I replaced them by picking up the connecting stitches in the neighboring blocks, cutting out the old blocks, then knitting the new blocks. While I was in town this week, my mom gave me some yarn to add to my scrap blankets. Some will go into the blanket that is made from sock yarn, and some will go into this heavier blanket. What are your favorite ways to use up scrap yarn?